Baby T-Shirt Olivia DayDream by Soft Gallery. 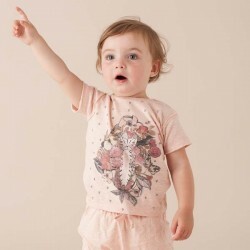 Baby girl short-sleeved T-shirt in vanilla melange cotton with Daydream print. Round neck. 100% cotton.